Motion activated floodlights are a common tactic for scaring away burglars. So common in fact, that their usefulness has diminished over time since most people know that they are just motion activated and not controlled by residents. Fortunately, with the emergence of wireless cameras, floodlight cams are becoming more and more popular. So if an intruder isn’t perturbed by your motion activated lights, maybe the added camera will do the trick. Even if it doesn’t, you’ll have evidence of the crime and have a much higher chance of getting them convicted. Wireless camera technology has come a long way in the last few years. Having several cameras monitoring the inside and outside of your home is no longer a huge ordeal and is becoming more and more cost effective. Not only are they getting cheaper, but they are also getting a lot easier to install. It doesn’t get much easier than sticking your camera to the wall and connecting it to your Wi-Fi. Floodlight cameras, like other outdoor cameras, are going to have a lot of different options available. The main difference between regular outdoor cameras and floodlight cameras are the floodlights themselves. Since floodlights require quite a bit of electricity compared to just recording video, most floodlight cams require you to wire them up to a power source. Both local and cloud storage options have their advantages. Local storage is cheaper in that it doesn’t require you to pay a monthly fee to store your video, but this option also leaves you vulnerable to someone stealing your footage and is less convenient for reviewing your recordings. Some companies will offer some free cloud storage, but most of the time you will pay around $5 a month for a 24-48 hour block of video storage. Live video is also a very handy feature and gives you the ability to check in on the camera feed if you get an alert from the motion detection. With live video feeds you won’t usually have to review your footage as often so storage is a little less important. Generally, you will need to connect your floodlight cam to a Wi-Fi network to access the live streaming features. Motion detection is an essential part of security cameras not only because they can alert you of intruders, but also because they can be set to record when motion is triggered. Having 24/7 storage of video would be costly and tedious for the average home owners without a security team monitoring the footage. Motion zones are a newer feature and help you to save even more footage by narrowing the field of detection to places that have a risk of intrusion. For example, you wouldn’t want a tree blowing in the wind to trigger your camera to record, but you would want someone walking up your driveway to trigger an alert. This will also reduce your camera from crying wolf all of the time and creating a habit of ignoring motion alerts. Another tactic these companies are adding to help prevent false alerts is to add suspicious detection algorithms to their software. Essentially they take footage of people sneaking around and other suspicious behavior and find patterns that the camera can look for. You can test this feature by sneaking around your own property in front of your camera and seeing if it triggers any alerts. Most of the time, floodlight cameras are going to be in areas where you are going to want to record a wide area. For this you’re going to want a camera with a super wide field of view. Generally you are going to want a horizontal field of view of at least 100 degrees and a vertical field of view of at least 60 degrees. Two-way audio allows users to communicate with people on the video feed. This can come in handy for directing package deliveries, helping someone enter the home, or even help you scare away someone trespassing on your property even while you’re away from home. Night vision is handy if you want to record without your floodlight on. One reason for this is that when you have a camera inside you’re floodlights, it is easy to figure out which areas to avoid to avoid being recorded. Light brightness is measured in lumens and for a floodlight you’re generally going to want a lot of lumens. The average floodlight has between 1200 and 1800 lumens. If you’re interested in connecting your floodlight cam to home automation features you’re going to want to see if it has IFTTT or Alexa compatibility. Amazon Alexa is a great way to automate your smart home products. Some floodlight cameras come with facial recognition software that will alert you if someone unknown enters your property. This technology has not been perfected yet and might cause some annoying situations. Some floodlight cams come with a siren to help scare people off when they are in an unwanted area. This feature can either be activated remotely or paired with facial recognition software and automatically trigger when someone unrecognized enters the cameras view. For outdoor cameras you’re going to want the video quality to be decent enough to recognize anyone on the camera. Other than that, the best camera is going to largely depend on your specific goals and what you think is important. That said, there are cameras that are worth the money and others that are not worth the money at all. So our formula here is record quality plus features minus the overall price compared with other floodlight cams with similar features. The Ring Floodlight Camera is essentially the name brand in the floodlight cam market. 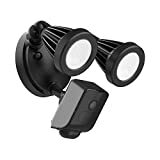 It has all of the main features that you would expect such as motion detection zones, night vision, two way audio, mobile alerts, and an ultra-bright set of floodlights with a siren. The main drawbacks are that it does not have any type of facial recognition (which doesn’t really work well anyways) and it’s a little pricey at $250 a pop. It has a 140 degree viewing angle which is plenty to see everything on the average driveway. The floodlights themselves are 1,800 lumens, which is a little above average. There are also live video features, cloud storage, and other standard outdoor camera features. You can also activate the siren with a button on the mobile app if you see something on the other end that you don’t like. While the features of the Momentum Aria floodlight cam seem to overshadow the Ring Floodlight Cam, we chose to put it at number two simply because their software seems to be a little less fluid than the rings. Which is understandable if you consider how much support and experience Ring has over other companies in the outdoor camera industry. 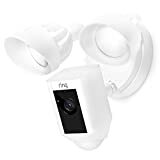 On the plus side, the Momentum comes with 30 days of free cloud storage, a huge motion detection range, facial recognition, high quality video and many other features that make it one of the best in the business. The best part is that these cameras are only $180 compared to Ring’s $250 and the Momentum floodlights are a whopping 2500 lumens! Now that’s a bright *** light! If you’re looking for a completely wireless option on a budget, then the Sengled LED flood light camera is a match made in heaven. While it may not be as robust as the other option, it makes up for it in convenience and price. The floodlights are only 850 lumens, but the camera itself has a full 140 degree viewing angle with high quality resolution and night vision. It has new person detection, two-way audio, live video viewing, and even 24 hours of free cloud storage! The best part is they are only $130 and since they are wireless take just a few minutes to install. Home security is a serious matter and if your security is not set up properly you’re leaving yourself at risk. Don’t over complicate your life, buy something pre-configured. Get Protect America simple and affordable Home Security as low as $30/mo. Get a free quote today and get up to $1,400 in free equipment shipped directly to your door.